St-Germain and Martha Stewart Living has partnered for Can-Can Classic, a cocktail contest that’s open to everyone. You don’t have to be a professional bartender to win a trip to Paris or $10,000 in cash. One hundred runner ups will receive a St-Germain bike. 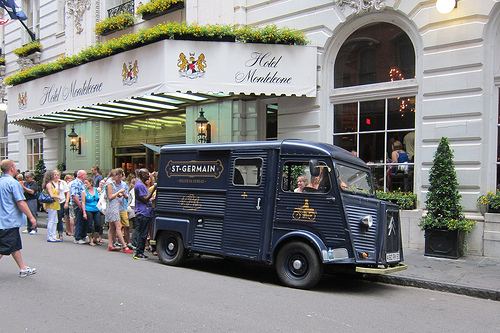 Submit an original St-Germain cocktail and the best will win a 4-night trip to Paris. US Residents except North Carolina and District of Columbia can enter by December 1. Limited to those 25 and older. I know the website says no California residents but they have assured me Cali folks can enter. Get some ideas for your cocktails at this upcoming St. Germain event at the Wine House. Please RSVP to secure your place, spaces are limited. $20 per person. Guests receive a custom glass St-Germain cocktail carafe and gift pack. This entry was posted in alcohol education, alcohol tasting, bar stories, bars, bartenders, cocktail competition, cocktails, contest, hot bartenders, la, la cocktails, los angeles, spirits, the minty, travel and tagged aidan demerast, bicycles, cash prize, elderflower, kylee van dillen, paris, st-germain, trip, vincenzo marinelli. Bookmark the permalink.